I arrived at Chicago’s infamous O’Hare airport at 7 am. I ran into a customer on the plane. Upon takeoff, she kindly offered me her copy of Oprah’s magazine to read on the plane, so I figured what the hell…I was going to Chicago and I did learn how to remove a mole with surgery. When we landed, we agreed to head into the core together. To my surprise, there wasn’t a cab to be found. Eventually, one arrived and it was the first of many pristine cabs (yes, I actually enjoyed the cabs in Chicago despite their stop and go and hornophilic nature) I would take during the week. The drive was slow and I eventually arrived at the Intercontinental Hotel on the magnificent mile. My room was ready, I dumped my bag and heading for a day of culinary adventure. Anybody who knows me is aware I’m a sucker for celebrity chefs. Graham Elliot’s sandwich shop, Grahamwich, allowed me to experience the fares of the heavy man without the need for a heavy wallet. Sitting downtown, it offers an arrays of sandwiches with sides including popcorn, chips, pickles and even soft serve ice cream. It’s a simple joint, with minimal seating and the trademark GE symbol painted here and there. It also has one of the most annoying songs I have ever heard on a website and no apparent way to turn it off. The staff resembled Graham himself, with slicked hair and wide-rimmed specs, although few would be able to mimic the speech of expectations related to cutting through the bread of a perfectly toasted sandwich. I opted for the waldorf chicken sandwich which included grapes, walnuts, gorgonzola and celery for $8. I threw in a large order of local pickles on the side and a homemade vanilla kola for $3 each. For good measure, I grabbed a maple bacon Long John which I venture to guess was a product of local bakery Glazed and Infused for $4. 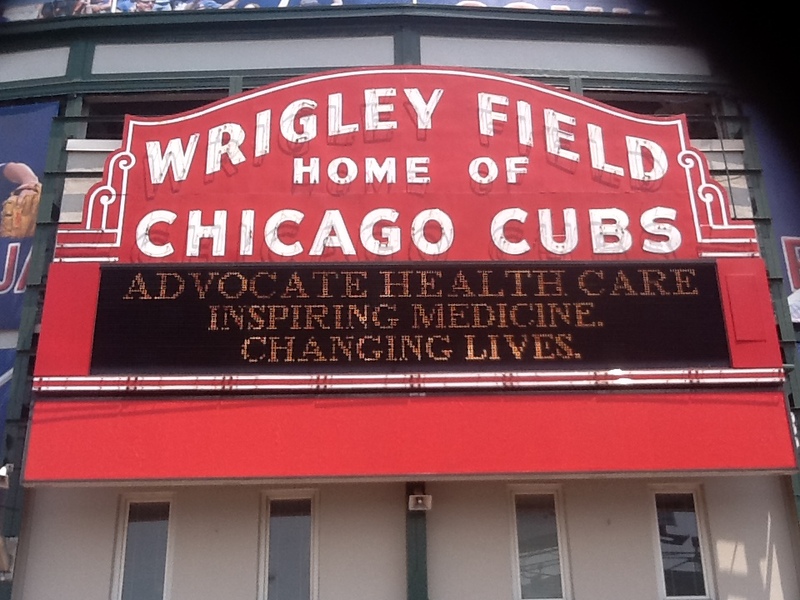 I grabbed my “To Go” pack, hopped on the subway, and jaunted up to Wrigley field to check out the field. Grabbing a bench outside the park, I dug in. The most underrated component of a sandwich is the texture. This one was a home run! Each bite was like a great pitching performance and a couple of base hits; the chicken salad that was firm and not soggy and it had perfect walnut and celery crunch and juicy pops of grape. Delicious! I opened the cup holding two flavours of pickles (traditonal kosher dill and spicy). Equally delicious. The drink was subtly sweet and very vanilla flavoured, a polarity that might turn off a soda-pop purists. All in all, a great lunch by a great park. 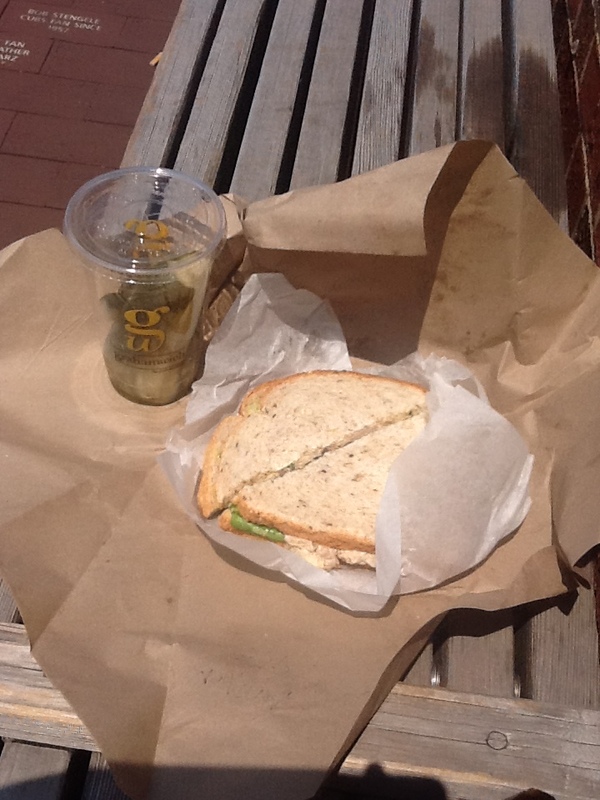 I even thought I saw a few tourists scanning the neighbourhood looking for the source of my lunchtime bliss. Satisfied, I snapped a few pics and hopped back on the subway and heading up the red line to stop #2. Along the way, I succumbed to the donut and tore off a quarter. 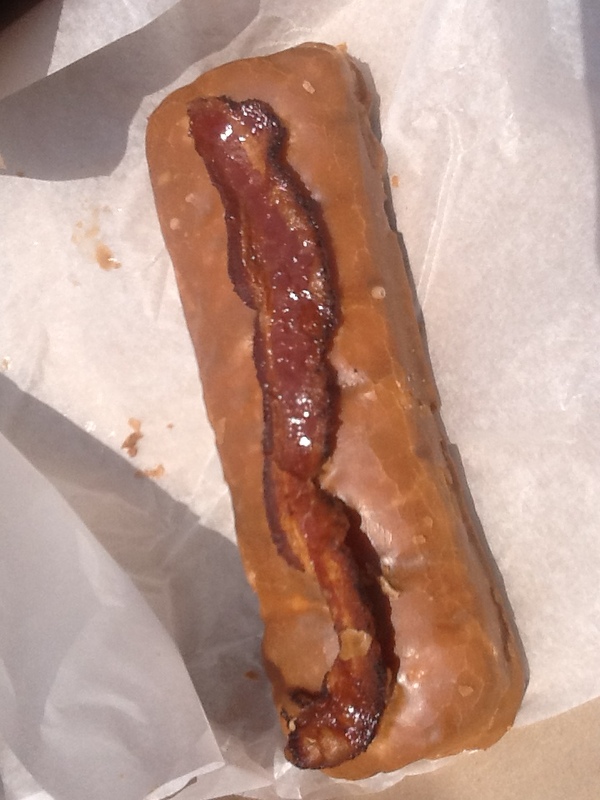 Anybody that thinks the combination of maple, bacon and donuts works…you’re right! It was sweet and salty and doughy. Let’s call it an achievement of the donut triple crown….or maybe the Cy Yum award. There’s a lot of hype about this coffee (it is served at GE’s restaurants after all), so I was hoping the subway ride up would be worth the visit. I walked past the patio (complete with the classic picture of my favorite bird with a smoke hanging out of his mouth and a caption reading “No Puffin”…come to think of it, how would a puffin get a cigarette in its mouth to begin with or light it for that matter) and into the rather large interior. The patrons were like a chess board; all sorts of sizes and shapes. On the other hand, the staff were similar; young and tattooed and ready to brew. I grabbed a Chemex (pronounced Chem-ex, not chem-A as some of us Canadians like to say in err) made with a nice Guatemalan bean. The execution was flawless and allowed 10 minutes or so for friendly banter. They take their coffee seriously and the final product reflected it. The payment machines were down, so I got a pat on the back and a “just pay when you leave”. 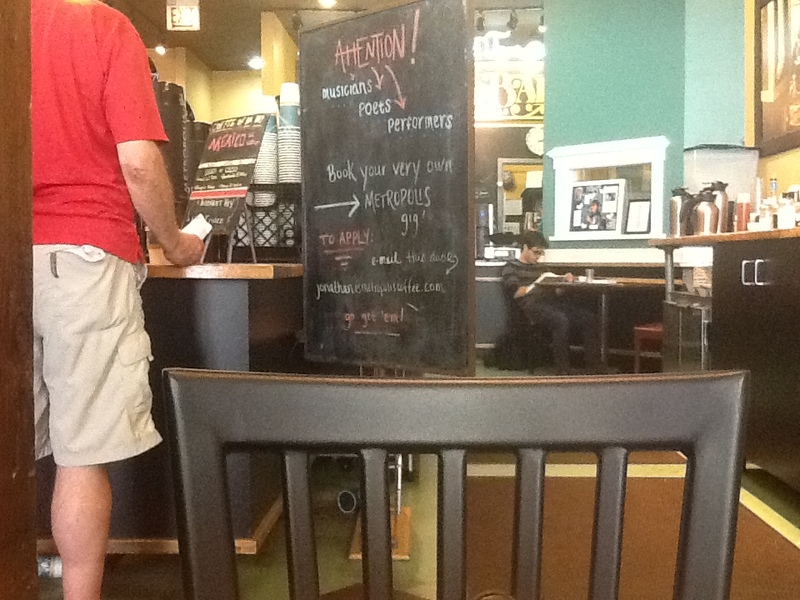 Great coffee, great service, great sign. By the way, I remembered to pay…can’t risk the karma coffee. Knowing I was in for a late dinner, I figured a mid-afterrnoon snack was in order. I decided to take a walk downtown and ended up at my first diner, drive-in and drive of the trip. BIG and Little’s is the brainchild of Hell’s Kitchen contestant Tony D’Alessandro, who was remembered having issues with segmenting grapefruit and who’s early and subtle exit was overshadowed by a volcanic blowup by some guy wanting to punch Ramsey in the face. Since then, he has found success in this cash only taco/burger/fish shack. It’s like a beach canteen in the middle of the city minus the seagulls, crying kids and barefoot patrons. The staff were friendly and the service was quick. 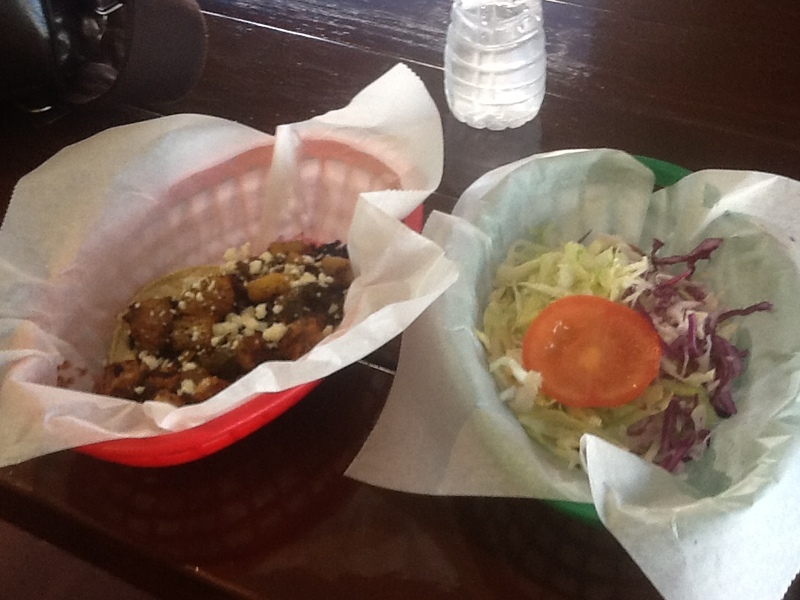 I ordered a Big and Little fish taco and al pastor (pork belly). Both tacos were good although I found too much sauce on the first and not enough rendering on the latter. Otherwise, the fish was cooked perfectly (although it was swimming in a sea of lettuce) and the belly was well seasoned and worked well combined with a few sweet pineapple chunks. The fois gras and fries and fish and chips looked divine, but I was going out for dinner later so I toned down a bit, not knowing of the microscopy-requiring meal to come. 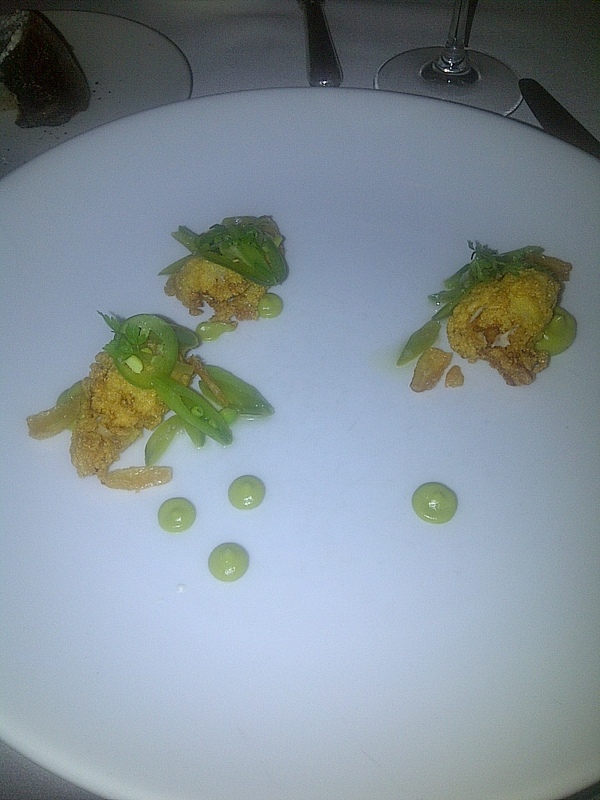 I’m going to do a full review in a separate blog, but one of the dangers of Michelin star restaurants is portion size. In this case, Blackbird could be renamed “Blackbird Food”. Bitesize frog leg portions, matchbox sized sturgeon and half a chicken wing were highlights of the dishes served. Although the flavours were nice, the crowded room, average service and the aforementioned small bites left this star shining dimly. The desserts were good though!